Don’t Discount The Table Appeal of Those Pesky Black Sea Bass! Black sea bass (Centropristis striata) can be pests, but they can also be fine table fare, if they’re in the legal size-limit slot (and if you catch as many keepers as you need for your crew!). When you find black sea bass, usually hovering over nearcshore rocky reefs all over Florida’s Big Bend off Wakulla to Levy counties, they’ll keep you and your crew busy with a steady bite and steady action. However, many of the fish you’ll land will not exceed the 10-inch (total length) minimum needed to harvest the species. You don’t need big tackle to target these grouper relatives. Light spinning tackle is fine, and small 1/4-ounce jig heads tipped with shrimp, cut bait (squid) or Berkley’s Gulp! bait will do the trick) Many anglers prefer Gulp! shrimp as it’s tough and often will last long enough to catch several black sea bass. Light jig heads tipped with Berkley’s Gulp! 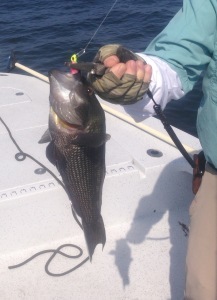 bait is a good choice for black sea bass. Black sea bass often reach lengths of 15-inches, but most times you’ll have to carefully measure your catch to be sure they’re legal. 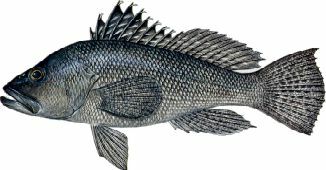 However, even a legal, 10-inch, black sea bass will yield a couple of “sandwich sized” fillets of beautiful white meat. Allow about 3 “keepers” per person for a successful fish fry. 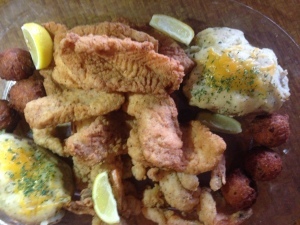 A platter of deep-fried black sea bass fillets is a crowd-pleaser!